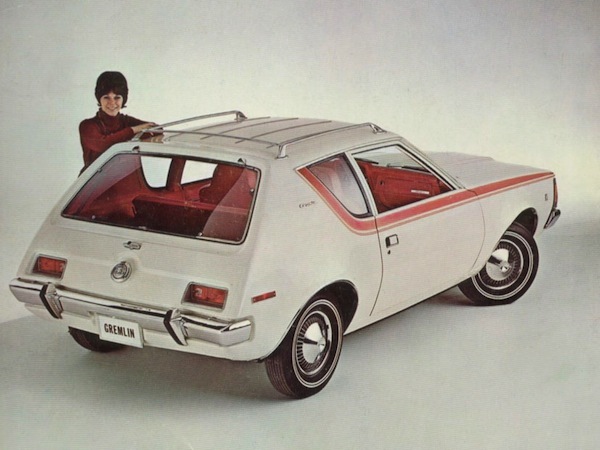 You are here: Home » Rob's Blog » The AMC Gremlin: Ugly, Cute, or a Muscle Car Before It’s Time? The AMC Gremlin: Ugly, Cute, or a Muscle Car Before It’s Time? I usually have to be motivated to find the time to write my articles for TheMuscleCarPlace.com. I have been absent for a few months because honestly I just haven’t felt all that motivated. But I’m back with a subject that has always been lurking in the back of my mind and I have a particular motivation that’s moving me to action. In the early seventies, shortages at the gas pump, high insurance costs, and the EPA came down hard on the muscle car era. As fast as the cars would go, that’s how fast the muscle car era ended. Arguably, by 1973 the muscle cars were now mostly stripe packages and a faint whisper of what had been roaring out of Detroit during the sixties and early seventies. A new breed of cars showed up in showrooms at the local dealerships, but unfortunately were cars we probably would prefer to forget (think Chevy Vega, Ford Pinto, and the AMC Gremlin). 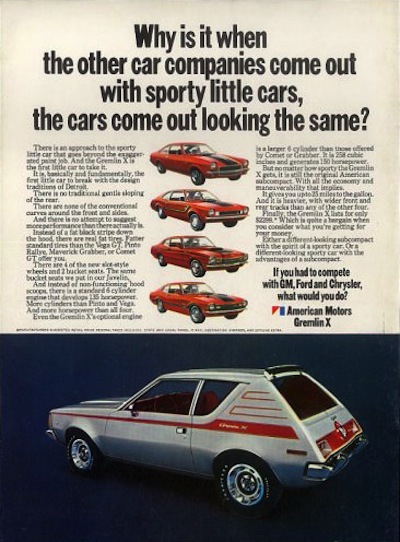 Mopar didn’t have a “new” car to challenge AMC, Chevrolet, and Ford, so their entry was the Plymouth Cricket and the Dodge Colt. The Hillman Avenger was a rear-wheel drive small family car originally manufactured under the Hillman marque by the Rootes Group from 1970–1976, and made by Chrysler Europe from 1976–1981 as the Chrysler Avenger. The Avenger was exported to North America and sold there as the Plymouth Cricket (and as a total aside, my brother had a Cricket until it got T-boned at an intersection). The fit and finish of the Vega, Pinto and Gremlin and most of the other cars from Detroit during the seventies begged for a better quality product to compete. The Japanese proved that just because a car was cheap didn’t mean that it also couldn’t be well built. At any rate, you could probably blame these cars for the entry and success of the Japanese cars and even Volkswagen into the US market. Starting at under $2,000, and boasting higher gas mileage, the Pinto, Gremlin and Vega were the answer to OPEC and the insurance industry. The muscle car that got me into AMCs in the first place was my cousin’s 1969 Castilian Grey, red stripe, 390, 4-speed AMX. I was 16 years old and fell in love with that car and AMC muscle somehow got into my DNA. I was never really all that big a fan of the “regular” AMC cars, but mainly just the high performance cars made by American Motors. In 1971 my cousin could no longer afford the insurance for the AMX because the monthly premium was greater than the car payment, and gas was now a shocking $0.39 a gallon! Waiting in line at the pump on odd and even days to get gas when the car only got 10 miles per gallon was getting old. So… he traded it in for a brand new 1971 Vega. My world came to an end. Within two years the fenders and rear quarters of the Vega had holes the size of a half dollar rusted completely through. It suffered from aluminum cylinder walls that would burn oil like a furnace within a few hundred miles from new. It was an engineering lemon, and the fact that it was John DeLorean’s baby (and he was the godfather of the Pontiac GTO) was a sad irony. The Pinto was soon the target of the National Highway Traffic Safety Administration for gas tank punctures leading to fires. It was a safety lemon and became something or a national joke (there’s a great scene with an exploding Pinto in the old Val Kilmer movie Top Secret though). Then there was the Gremlin. The Gremlin was a styling lemon. Technically it was a pretty good car for the time. It had the proven reliable seven main bearing straight six that stayed in production as the Jeep 4.0 High Output powerplant right up to 2006 and also had the reliable tried-and-true Chrysler TorqueFlite transmission. Unlike the Vega and Pinto, the Gremlin X could be had from the factory with a 5.0 liter V8. But the Gremlin has been the brunt of jokes for years, and was tagged in 2009 by Business Week as one of the “Ugliest Cars of the Past 50 Years”, and by Time Magazine as the “50 Worst Cars of All Time.” Other cars were called out in those type articles too; again the Pinto and Vega, but also the Chevette, Mustang II, Corvair, Pontiac Aztec, Edsel, etc. 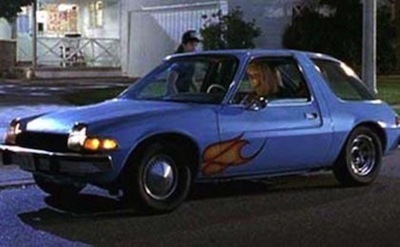 The AMC Pacer from the movie Wayne’s World. It’s NOT a Gremlin! AMC was not alone in designing lemons. But with the controversial designs of the Gremlin and the Pacer, the entire company was badged with a legacy of weird cars. Everyone seems to forget the Javelin, AMX, Rebel Machine, and Hurst SC/rambler. If everyone tagged GM similarly based on the Vega, Corvair, Chevette and Aztek, or Ford for the Edsel, Mustang II, Pinto, we would never buy another car from Detroit. Now back to the subject – was the Gremlin ugly, cute or before it’s time? The argument could be made that it was before it’s time. I passed a Nissan Leaf recently and it looked like a modern re-incarnation of the Gremlin; stubby, cut off, slanted rear-end with a small cargo area. Actually quite a few new cars are looking more Gremlin-esque these days. As a muscle car guy with a slant towards AMC muscle, I tend to think of the Gremlin as cute and quirky. No matter what, some will always think the Gremlin is Ugly. But the thing that’s interesting to me about the Gremlin is that it is now a symbol of the pop culture of the 70’s and gaining a level of “coolness” that it never had. It was a product of the 70’s; a time of crazy big hair, bell bottoms and the Bee Gees. I suppose I’m a product of the 70’s too since I bought my first car in 1970, but that’s another story. So, I build AMC muscle cars and love doing it too. It’s kinda the underdog syndrome that keeps me trying harder to reach the next level of performance, handling, stance and build quality that keeps me interested. I wonder what a pro-touring Gremlin would look like. So, what is my new motivation? It could be my new 1973 Gremlin X!